suctioned fluids without operator exposure. of disposable supplies and waste disposal. DM6000 in a reprocessing room, usually supplied with foot switch (right) for hands free operation. The DM6000-2 is two suction-drain systems in a single housing! 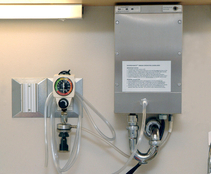 A few inches wider than the DM6000, this unit has two suction connections and connects to two suction sources. The DM6000-2 is popular in endoscopy centers where EGD, ERCP, Bronchoscopy and other procedures requiring two suction fields are performed in addition to Colonoscopy, where the second connection provides for a back-up! For Cystoscopy, Urology, Arthroscopy and those procedures requiring management of large fluid volumes, our DM6000-2A is designed to meet your needs! The unit aspirates unlimited fluid volumes. An optional fluid totalizer records aspirated volume. One vacuum and two drain connections are required. A one-step alternative to rolling collection systems, a DM6000-2A does not require relocation for fluid disposal, and is a closed-system alternative to flushing floor drains! CLICK ON IMAGE (LEFT) TO WATCH ANIMATION OF UNIT OPERATION (TAKES SEVERAL MINUTES).